Checking for front / back focus and fine-tuning camera autofocus. Thinking of paying for a lens focus calibration service? Why? You may not even need your lenses/camera calibrated, and even if you do, there are many ways of doing it completely free. It’s really simple to do. Please read what’s here and save your self the time and cost. Many newer DSLRs have the facility to individually tune the AF settings for different lenses via a custom setting (the micro adjust function). This article covers some of the techniques for making the adjustments. It also includes links to reviews looking at some of the hardware and software that can help with the process. 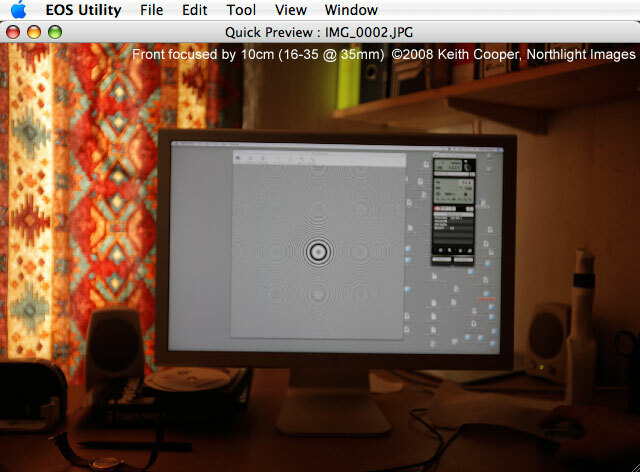 Note… You can use the Moire fringe technique to check any (digital) camera AF system for back or front focus. Canon 1D X, 1DIII, 1DIV, 1DsMkIII, 5DII, 5D3, 5Ds(R), 50D, 7D, 7D mk2, Nikon D3, D3x, D4, D5, D300, D500, D700, D800 Sony A900, Pentax K20 (note that the EOS 60D does not include this feature) The EOS 1D X / 5D3 / 5Ds /5D4 now allows separate AF Microadjustment for both the wide angle and the telephoto settings of a zoom lens. Sometimes, different lenses might consistently not focus perfectly (front or back focus). This can now be adjusted for individual lenses. Some cameras even allow for multiple copies of the same lens to be individually adjusted. We’ve got a downloadable lens calibration chart to make this process easier. The lens calibration target is easy to set up and use with an LCD monitor. It’s important to realise that any system of parts with individual tolerances can exhibit significant variance if the assorted ‘errors’ all stack up in one direction (they can just cancel out too). This is a key element of engineering design for manufacturing. Whilst expensive lenses and an expensive camera should ‘just work’ there may be room for improvement. Note – I’m using the 1Ds3 as an example here – this procedure works with any camera that has some way of fine tuning the AF performance, and a ‘live view’ mode. Previously you could get Canon to calibrate your lenses and bodies for you, but this entailed sending the camera off for the work. The 1D Mark 3 and 1Ds Mark 3 both allow customisation of the AF settings, although you should note that if you try a whole lot of lenses and they all require a considerable adjustment, then it may be that your camera body needs fixing. The adjustment is in the Custom functions menus (C.Fn III-7 AF Microadjustment). A setting of 0 will clear all AF adjustment information, 1 will enable the global adjustment, while 2 will set individual lenses. If all lenses front or back focus a little then you can apply a global adjustment. Canon have a 1D /1Ds3 ‘Optimising Camera settings’ document [PDF](German translation [PDF]) available which has some useful background info on many of the adjustments and settings you can make to these two cameras. I was sent details of an excellent post on OPF by Bart van der Wolf, covering his use of a fine graphics design on an LCD screen. I’ve -part- of the autofocus test image I’ve been using at the right. The large image plays tricks with your visual system, so be wary of this if you have any difficulties caused by repetitive patterns. Download (zip file) a 1000×1000 pixels square version. 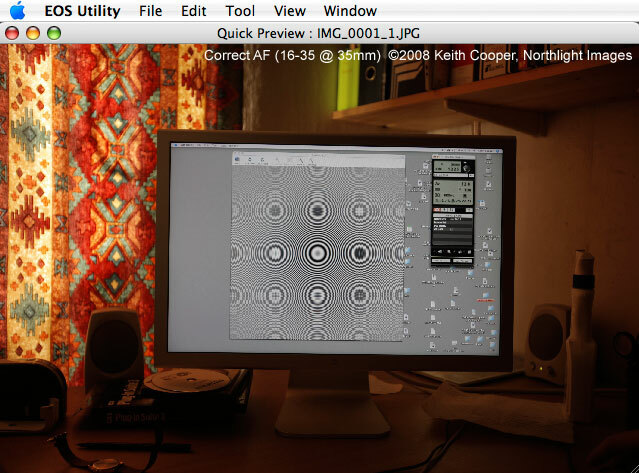 The principle is that you display the square GIF image (at 100% full size) and focus on the computer screen, using liveview (zoomed if need be) and maximise the appearance of Moire interference patterns. Do not make the image ‘fit’ your computer screen, it needs to be unscaled. You will need to have the camera mounted on a tripod and directly facing the computer screen. Take some care to get the screen square on and lined up with the camera. If you want to be really accurate with lining things up, put a small mirror up, flat against your screen (or target). When the camera is proerly square on to the screen, then the reflection of your lens will be visible right in the middle of your viewfinder. The interference patterns come about from the interaction between the image pixels on your screen and the pixels of your sensor. They may not look exactly the same as in the examples below, but you should notice a distinct peak in the amount of detail visible – that is the focus point. You then switch off liveview and part press the shutter button to activate AF. Look carefully at the lens distance indicator as you do this … if the lens and camera combination is spot on, then there will will be no movement of the lens focusing ring and the image will not change. … no movement of the lens ring at all. The lens is spot on. Reactivating liveview showed the patterns I’d seen after manually focusing. There could be a slight difference since the interference technique is very sensitive. If you are not sure, then try the test again with an adjustment of + or – 1. you should see a difference. It’s difficult to show graphics here, but the first image gives an idea of the rear display when manually focused with liveview, while the second shows the view after getting the camera to autofocus (where an adjustment is needed). I’ve exaggerated the difference slightly for showing here. It’s actually only a few centimetres difference in focal distance, but the interference effect allows you to get critically sharp focus. I noticed some patterns in a quick check with a CRT (if this works fine – please let me know? ), but I’d prefer a LCD (a laptop is useful for testing longer lenses). My 23″ Apple Cinema display shows patterns much better with my Canon 1Ds3 than my 15″ MacBook Pro with its higher resolution (pixels per inch) screen. If you are having difficulty with longer lenses, I’m told that a laptop outside at night works quite well. The exact pattern you see when sharply focused, depends on your LCD screen and its pixels, since it’s the interference between the screen version of the image (and its individual pixels) and the pixels of your sensor that result in the aliasing. It was different with each lens and at different distances. The effect should be very obvious to see – you are looking for a peak in the pattern’s visibility, not any particular amount of pattern. It’s worth testing your lenses in different conditions and trying a few ‘real world’ photos as well. I’d not even noticed the error on the 14mm and a few quick test shots at f/2.8 show a just perceptible increase in sharpness. Do remember that all AF systems have a degree of tolerance in them, so don’t get carried away spending hours chasing ‘perfect’ focusing. You are adjusting a camera, not building a space telescope! I repeated each measurement several times just to be sure it was real and not a ‘glitch’ in the AF. An alternative way of testing is to always start with your lens set at infinity. You line up the target and activate AF. Then turn off AF and activate liveview. You should see some form of Moire pattern. Turn the focus ring to a slightly closer distance – does this initially make the pattern more obvious? If so then you have an element of backfocusing. Adjust the AF setting to compensate (positive numbers on my 1Ds3 for back focus). Repeat the process until any movement of the focus ring lessens the visibility of the Moire. I’ve seen it suggested that by starting at infinity and letting the AF work at the start, you are getting more consistent results. Some people have contacted me after finding that they couldn’t get the moire method to work with their screen. It seems that very high resolution LCD screens present the image a bit too small. 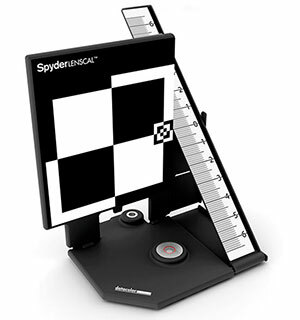 A target based approach might be of help if you’re having problems – take shots at +20,1,0,-10,-20 and just look at them, see the SpyderLensCal review for a more general discussion – not just based on that device (a sheet of graph paper can work, with care). If you want to try this with a camera without liveview then just shoot a picture of the screen using AF and then two more with the focus ring manually moved +/- 5cm. Hopefully the AF version should show some fringing not visible in the other two shots. If all your lenses show a slight shift then it -might- be worth getting your camera serviced? The second picture below, was manually set to front focus by at least 10cm. This is quite a bit, but I’ve done it to show the effect you are looking for. I’ve also taken the photo from closer than you might use for a real test. Both of these shots were shot tethered and the images you see above are screenshots of the ‘Quick Preview’ from EOS utility. I did this so that I could use an un-resampled image, since any resampling of the image can introduce new moire (these effects are not easy to show here!). Remember too, that both images show some asymmetry in the patterns which indicates that I’ve not got the camera fully square on to the screen. Thanks to all the people who’ve written in with questions, and refinements to the technique. I’ll be sure to keep the page updated if any new techniques or tips come in. This is Canon’s suggested technique – I cover much more about using similar techniques in my review of the SpyderLensCal device. Mount the camera on a good tripod. Set up a target for the camera to focus on. The reference target should have sufficient contrast for the AF system to detect. It should be flat and parallel to the camera’s focal plane, and centred. Lighting should be bright / even. Camera-to-subject distance should be no less than 50 times the focal length of the lens. For a 50mm lens, that would be at least 2.5 meters. Set the lens for AF and the camera for One-Shot AF, and manually select the centre focusing point. Shoot at the maximum aperture of the lens via manual mode or aperture-priority. Adjust exposure level to get an accurate exposure. Use low ISO setting. If the lens has an image stabilizer, turn it off. Use a remote switch or the camera’s self-timer to fire the shutter. Use mirror lock up as well. Take three sets of images at microadjustment settings of -5, 0 and +5, i.e, three consecutive images at -5, three consecutive images at 0, and three consecutive images at +5. Look at the images on your screen at 100% magnification. Take additional sets of test images at different microadjustment settings if necessary until the sharpest image is achieved. Register the corresponding microadjustment settings in the camera. For best results, manually set the focus on the lens to infinity for every exposure before allowing the camera to autofocus the reference target.Expect some minor variations in focusing accuracy within each set of three test images, even though they were all taken at the same microadjustment setting. This is completely normal, and is due to the tolerances of the camera’s AF system.Expect smaller microadjustment settings to have a greater effect with telephoto lenses, and vice versa for wide-angle lenses. If you are attempting to set microadjustments for a zoom lens, it is important to realize that the camera’s setting may only be accurate for the focal length setting you test. The instruction book suggests testing at the longest focal length of the lens, but you may find it more efficient to choose the focal length you use most often. If you find that it is very difficult to achieve a precise sharp focus (particularly with slower lenses) you can lower the 50x distance limit somewhat, however I’d personally not go much closer than 30x. You can see just how little change there is during the focus stepping in my SpyderLensCal review. Make sure that the camera is square on to the target, and that the target is sufficiently flat. Something like a bank note usually has a lot of fine detail, if you don’t have a convenient ISO chart available. Click on Camera setting/remote shooting icon. Click on Remote Live View Shooting. This will open a new window with live sensor video feed. Make sure that AF is in phase detect mode (quick mode AF). This uses the camera’s main AF sensor. Choose the centre AF point and make sure the white rectangle is centred on the AF point. The AF points pattern will be different for different cameras. Click on the magnifying icon for a full size view. Click the AF ( ON ) button in the focus section of the controls. The camera will now autofocus on the target. Click on the 200% magnification checkbox. The view on the screen is now at 2:1 magnification. Note that it is essential that your tripod is placed on a solid surface, since anyone walking round will easily produce vibrations you can see. Each click on the ( > ) or ( < ) buttons corresponds to one unit in the AF micro adjust scale in the camera. Disengage LV by clicking close in the Zoom View and Remote Live View Windows. Go to microadjust (MA) menu option in your camera and set the amount of adjustment (for this lens) to the exact value recorded, noting the back or front direction. Go back to step 3 and perform AF again. If the image is already as sharp as possible when you click 200% you have sucessfully set an adjustment value. If still not right then go through this procedure until you can consistently get the sharpest image. You can shoot test images and transfer directly to your computer. Some notes – I’ve not tried this particular method yet. If anyone finds it particularly useful, or has any suggestions to make it better, then please do let me know? If you’ve come directly to this method, do read some of the caveats in the notes from Canon just above this section. So, how good is AF? Possibly better than you’d thought, but for anyone really getting into checking the minutiae of AF performance, I’d suggest reading this article. Of course, if you had a camera that incorporates both Phase Detect and Contrast Detect AF, then you could just point it at a target and it would self calibrate the AF. Datacolor produce device to make the process easier – we have a full review of the SpyderLensCal. The review also has a more general discussion about using targets for focus adjustment. Despite my initial distrust of such devices I can see situations where the SpyderLensCal would be of use, particularly for longer lenses outside. See my review of Reikan FoCal for software that can automate much of the adjustment process for Nikon and Canon cameras that support adjustment. Much as I might like the Moire technique, I know some people prefer an actual target. It won’t cost any more (nor less we’re afraid) but will contribute towards the running costs of our site. Absolutely anything whatsoever you order from Amazon helps us run our site - thanks to everyone who has purchased items, however small.